Roush Mustangs and the Ford Mustang share a common history, much more than simply the specs of the Mustang. The oush Mustang is based on the Ford Mustang GT Premium package. Jack Roush, the creator of the Roush Mustangs and the originator of Roush racing, began his career in 1964, as an engineer at Ford Motor Company. At the same time, like the rest of America, his love for the new Mustang included the purchase of his first Mustang in 1965. Roush's interests led him to racing and a profession as a drag racer. But his love of racing led him to other endeavors, including SCCA Trans AM, IMSA and NASCAR. Like another Mustang icon, Carroll Shelby, Roush was also a strong businessman, using his educational background and engineering expertise to found his own company, Jack Roush Performance Engineering in 1976, which led ultimately to the current Roush Industries. But it was his other company, Roush Racing, which he started in the late 80's that made headlines throughout professional auto racing. SOme of the big names associated with Roush Racing include Matt Kenseth, Mark Martin and Carl Edwards. 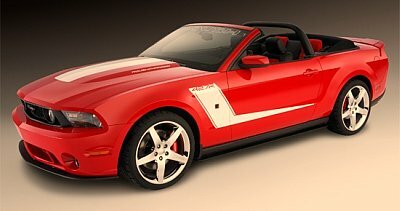 The Roush Ford Mustang was born of Jack's love of racing, hot rods and his personal love of the Mustang. What made it all work, was his OEM expertise, engineering and manufacturing capabilities, combined with his deep knowledge of how to make any kind of race car go fast. Unlike many other "tuner" Mustangs where a body kit seems to be most of the modifications, or perhaps engine performance enhancements,with some body mods, the Roush Mustangs were created to blend performance, handling and looks into one slick package.Nonetheless, his early cars were sometimes criticized for not having enough power to follow his other improvements. The Roush Mustang became a fixture in the racing world in early 1987, beginning in several Grand Touring forms and Roush wasn't slow in pitching the powers that be at Ford, on the idea of mass produced Roush Mustangs, which could be offered throug Ford's dealer network. While interested, Ford declined his first offer. But that was not the end of the Roush Mustangs, and in 1994, the First generation of Ford Mustang based cars hit the streets. The cars were offered in Three Stages. Stage l was strictly an appearance package, consisting of body add ons. Stage ll added a race proven suspension package, which pushed Mustang skidpad numbers into areas most pony car enthusiasts had never seen before. Pieces included Hyperco coil springs, Roush/Koni double adjustable struts and shocks,30mm front and 27mm rear sway bars. Stage lll included hot rod techniques and parts from the Ford Racing bin to bump up power from the stock GT by almost 50 horsepower. Not one to sit still, Jack created ROUSH Performance Products in 1995 to produce and sell aftermarket performance parts, including performance crate engines. Some of these high performance parts included iron and aluminum CNC ported GT40 heads for both 5.0 and 5.8 liter engines. Aluminum heads get larger Manley 1.94 intakes as well as Roush CNC ported Trick Flow heads for big blocks. Suspension bits included panhard bars for sn95 mustang, traction bars,and handling packages. What made these packages unique, was the level of engineering that went into making the packages fit together into one well thought out and sorted out car. Roots supercharger with 6 psi boost,svo high flow aluminum heads with larger repositioned valves and reconfigured ports. stainless steel shorty headers,side exit exhaust, k&n filter, engine tune, 3.55:1 rear end, just like the originals. Available 3.73:1 ratio. Dyno'd at 315 hp @ 5500 rpm. 345 pounds of torque. Suspension is lowered as previously, shocks,struts and springs like earlier and custom rear lower rear control arms. 4 wheel cross drilled 13" rotors with Brembo calipers on stainless lines. 18 inch wheels on 245/40zr18 front and 295/35zr 18 rear with comp TA's. The interior is all Mustang, but comes with embroidered Roush floor mats. Quarter mile 13.7 seconds at 103.7 mph. fuel economy 14/23 highway,with a production of approximately 250 of the Roush cars. The 2010 Roush Mustang 427R has some important improvements from the 2009 Model. Power from it Roushcharger supercharger raises the bar to 435 horsepower and 400 lbs of torque, a solid improvement compared to the stock 2010 Ford Mustang GT. The stiffer, modified suspension gets the job done and makes a substantial improvement on the stock Mustang. Here's the link to all the Roush 427R specs.